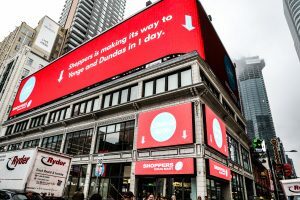 TORONTO — Shoppers Drug Mart officially opened its doors today at Toronto’s Yonge and Dundas Square. The new location is a unique reimagining of the space once occupied by the Hard Rock Cafe and Friar’s Tavern, offering consumers a refreshed design and a convenient and interactive retail experience while paying homage to its predecessor’s iconic history and musical roots. beautyBOUTIQUE: Quo Beauty Wall and Indie Beauty selection – Located within the Enhanced beautyBOUTIQUE, the Quo digital wall provides consumers with beauty information tailored to their selections and preferences. The enhanced beautyBOUTIQUE location also offers a rotating selection of unique indie beauty brands for customers to explore. 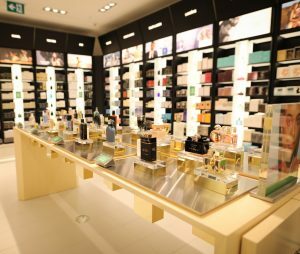 Customers will also have access to the expertise of Shoppers Drug Mart Beauty Experts and services such as personalized skin care consultations and make-up applications. Historic Tribute to Yonge and Dundas Square – A tribute to the significant role this space played in the rise of Canada’s musical and pop culture scene from the 1950’s as Friar’s Tavern through to its time as the notable Hard Rock Cafe. This space will include artifacts from these venues as well as memorabilia from some of Toronto’s music legends, in addition to an interactive timeline that allows shoppers to see historical highlights come to life through photos and video. Enhanced convenience food offering – As experts in health and wellness and now a division of Loblaw, Shoppers Drug Mart is committed to offering customers an assortment of fresh and healthy food items that can be purchased on the go. At the Yonge Dundas store, customers can find a great assortment of food including: fresh produce, PC Kabobs, pork chops, ground beef, burgers, chicken breast, sausages, and salmon, grocery items such as cereals, soups condiments, ice cream and various frozen foods, ready-to-eat food such as sandwiches, wraps, sushi, as well as fresh pastas, sauces, quiche and meat pies. Pharmacy – The location is owned and operated by Andrew Yeh, who has been a pharmacist in the Yonge and Dundas community for the past ten years. In addition to the full-service pharmacy, the store’s offering will include digital pharmacy, where patients can manage their prescriptions online, and compliance pack services so patients can have their medications organized by date and dosage time in blister packaging. Full service Canada Post post office – Customers will have the choice of visiting staffed counters or a self-serve shipping station to make purchases and send parcels at their convenience. The unique self-serve technology allows customers to print shipping labels or stamps, drop off parcels in a secure drop box and pay by debit or credit before receiving a receipt with the tracking number, giving customers greater control over their parcel shipping experience.